This morning at the Sam Noble Museum of Natural History's bird collection I drew from skins and mounts of lesser and greater prairie chickens. Value, composition, color, point of view: I wish I had a recipe for making a painting- it would go a lot faster. For this one, I started with a long drive on the western prairie and an comparably open, empty mind. No prior concept, no preconceived notion, nothing in the bag except the one condition that there must be a prairie chicken in there somewhere. A lesser prairie chicken, no less. I was there on the bluffs at dawn; the sunrise lit the tops of bluestem clumps and reflected white off the gypsum-capped mesas. Down below the river twisted slowly across the plain, still in darkness. It was a clear clean morning but it was easy to picture a spring storm roaring up over the bluffs with a thundering bass rumble under the bird’s cackles and booms. 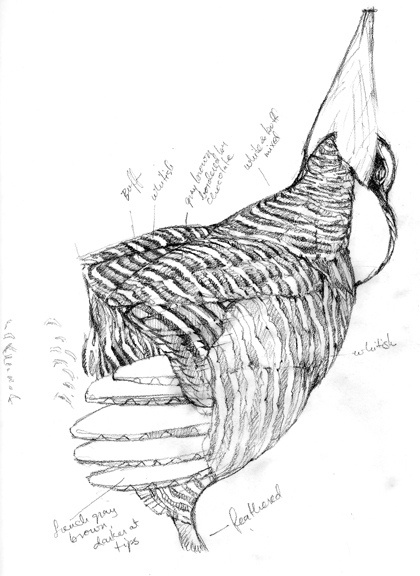 Down on my knees in the grass, getting eye level with an imaginary prairie chicken, I drew little sketches in pencil. 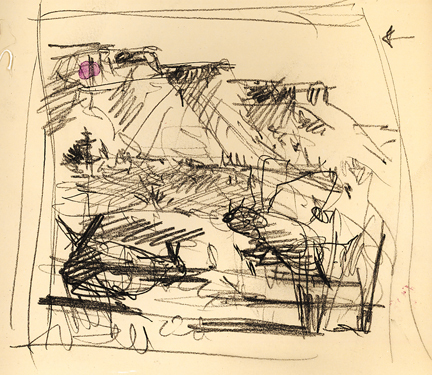 Thumbnail sketches made on site for the poster artwork for the Lesser Prairie Chicken Festival. 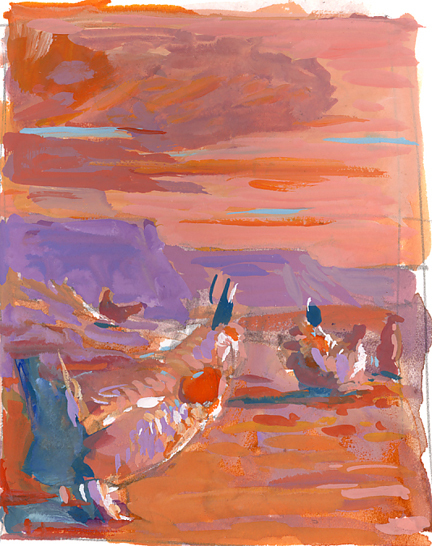 Color thumbnail rough made from the sketch above; this little painting measures 2 1/2"x3 1/2" and was done in gouache. 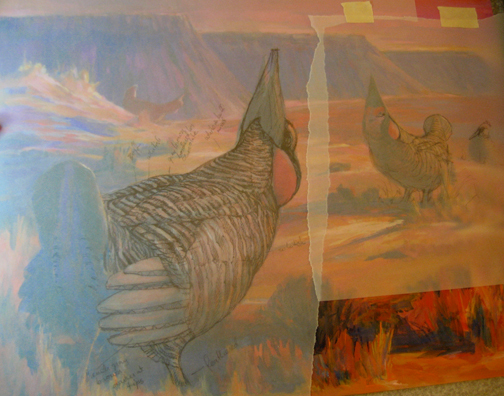 A tissue overlay lets me work out the feather tracts and patterns. Drawn at the museum, with the aid of skins. It’s funny how being on my knees on the real honest western American range could wake something up that had been asleep for awhile. The prairie is a lonely place; not for the faint-hearted, not where I’d want to go live; my solitary nature would dig into the sod and go all hermit on me-but there’s something out there I’ve known all my life and I can’t give it a name. Whatever it is, once I got home I dusted off my guitar and banjo. The songs that first came to mind were the old ones from long-ago cowboy singers and string bands of the Great Depression: Patsy Montana, Woody Guthrie and the Carter Family. Yodeling was required. There were herds of cattle lowing and campfires and coyotes, painted ponies and lonesome prairie flowers. These may be good songs for our times once again. The prairie may be lonesome, but it’s a rich place for the quiet, uncluttered mind. 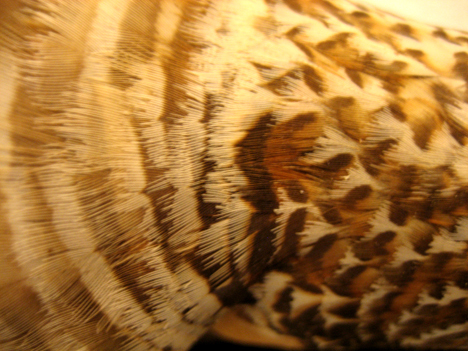 Throat feathers of a male lesser prairie chicken. What a beautiful tribute. So few people really know how incredibly rich and moving that land is there in western Oklahoma; very few Oklahomans, as well. The UN should make these disappearing lands a World Heritage site. “It’s funny how being on my knees on the real honest western American range could wake something up that had been asleep for awhile….there’s something out there I’ve known all my life and I can’t give it a name.” I couldn’t give it a name either, until now: home. Lovely, Debbie. Rich with appreciation and depth. I agree with TR, it should be revered as a world treasure. Having lived there as a child, I concur – it is indeed home. I love the quiet when it’s quiet and the noise when it storms — and the smells and the color and the excitement of the everchanging prairie, whether gentle or rambunctious. It’s definitely not a place for sissies. I’m glad I got to see it myself and humbled by those who live there (and those who grew up there, Becky and TR!). There are special places in the world and that’s one of them. I just love this blog and so love your work. I appreciate all you share here – it cheers me up every time I come here. Thank you so much!!! Debby, I just caught up with your recent posts and Wow it’s all amazing. 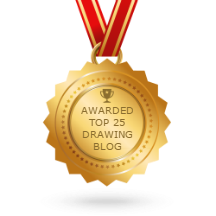 Your pencil sketches are remarkable and it’s especially exciting to see them progress to color. What skill you have. Thanks for posting the photo of you in your studio. 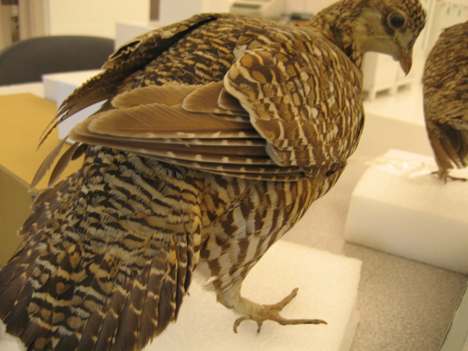 Your Prairie Chicken exhibit will be fantastic! Wow, great post. This is like real Prairie Home Companion. From “a recipe for painting” to Patsy Montana. A long journey in very few paragraphs. Though most of your responses have been about the beauty of the area, and I don’t doubt it, I think I’m more impressed by the idea of going out to the area with “nothing in the bag”, no preconceptions, just seeing what the land itself would inspire. It’s a great way of working if you can somehow find the time and motivation to do so. Say — Do you know where i could find a quiet, uncluttered mind? Wow, wonderful to read and wonderful to see the process from sketch to painting. I have only recently had my first experiences getting out in the middle of the prairie and I do find it moving. You describe it beautifully. these pictures are garbage, crap!!!!!!!!!!!!!!!!!!!!!!! !